Andy Conboy, new development manager for McDonald's Restaurants in Hawaii, visited the newly rebuilt McDonald's at Kaneohe Marine base on Thursday. The branch was completely torn down and rebuilt. » Was director of real estate and facilities management for Papa John's Pizza. » Worked from 1987 to 2000 at his father's appraisal company, Hastings, Conboy, Braig & Associates. Conboy, 42, was born and raised in Coronado, Calif., and moved to the islands in the early 1970s. He graduated from Saint Louis School in 1981 and got his bachelor's degree at the University of Portland in Oregon. Question: What is your new job description? Answer: My position is interesting in that ... in McDonald's you normally have a real estate person, a construction person and then you have an asset manager. We lost our asset manager for the Western region. So I'm handling the Hawaii region as far as being asset manager, and I'm wearing all three hats at once, including real estate and construction. Q: What attracted you to the company? A: There was the desire to work for McDonald's. McDonald's wrote the book on location, location, location. ... They have a really amazing company to work for, with some 30,000 stores worldwide. Working for a company that has a product everyone knows and loves. Q: What kind of shape are the Hawaii McDonald's restaurants in? A: We're in the process of reimaging all of our stores. We've realized it's time to get some TLC back into the stores. We've identified stores that we're working on now. We're reimaging under the "forever young" concept. Hawaii consumers will start seeing some changes: tile, lighting, decor, color schemes. You'll see a move away from bright colors to copper, bronze, blues, earth tones. You'll see that in restaurants in the next year or two. We just completely redid the McDonald's on the Kaneohe Marine base. It reopened yesterday for business. Q: Will you be redoing all 76 stores in the islands? A: Yes and no. For the stores that are owned by McDonald's, I would say yes. But the owner-operators have to sign on. Some of the stores are newer than others. We know we have some stores we need to look at and we're in the process of doing that. Q: How many stores are franchised? A: Of the 86 total stores in the region, 48 are owned by the owner-operators. Q: What stores will be upgraded? A: On Oahu, Temple Valley, School Street, Waipio. Also we have a relationship with Wal-Mart and we're going to reimage in the Waipahu store. Q: Where are you looking to open new stores? A: We've identified areas. We'd like to be part of Kakaako, Kapahulu; there's some neighbor island locations. 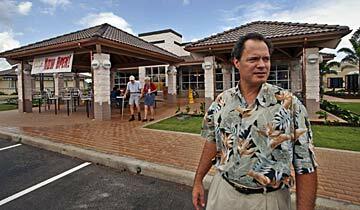 McDonald's wants to be in the growing areas; obviously for Oahu, that's West Oahu. McDonald's is always looking for unique opportunities. ... For us, the numbers have to work. With real estate ... my job gets a little trickier because things have to pencil out. With the soaring value of real estate, it makes it difficult. Q: How do you make the numbers work? A: I really do think that in today's marketplace you've got to be creative. You've got to bring young, fresh ideas. ... Whether that requires us looking into co-branding with somebody, doing a joint development with somebody to minimize costs, that might be one option. A stand-alone site for any retailer is not cheap at all. The expanding economy has been good for everybody but it's not good if you try to buy or rent. You used to be able to drive around and say, "I like that site and I like that site." That's not the way it is anymore. Q: Does your appraisal background help? A: Appraiser skills are very important. In the asset manager role, it's important to understand principles of valuation. That's what they were interested in when I was hired. McDonald's puts a lot of homework into a site. A: Demographics -- where are customers going to be coming from? We look at the amount of population, homes, work. We look at shopping generators, hence the Wal-Mart relationship. Where are all of our customers coming from? What side of the street do we want to be on? Typically, the morning side is what we want to be on. We're dealing with competition. We're not seeing it here like on the mainland, but competition is anyone who serves coffee, so we have to take all those considerations in. If I open a store, am I going to destroy another store? Q: Are you closing any stores? A: In any business it's inevitable that things are going to occur. There might be a couple coming up down the line but we're optimistic we can find something that will replace them in that marketplace so customers aren't left high and dry. It just comes down to economics. Q: What did you do for Papa John's? A: After I left my dad's appraising shop, I got offered a job at Papa John's. But it got to the point where they weren't big enough to have the position. What basically happened is they kind of got into all the markets they needed to be in at the time. That's when my position got segued into more of an operations mode. I was training in the restaurants, making pizzas and managing crews of drivers and in-house staff. I was managing the Kailua store for close to six to seven months. The McDonald's position is more entailing than that, but I really liked what I did for Papa John's. With Papa John's, there was no demand for that position at the time. McDonald's, with 86 restaurants in its Hawaii region, you need a full-time person doing this. Inside Hawaii Inc. is a weekly conversation with business and community leaders. Suggestions can be sent to business@starbulletin.com.